Please Contact Us for more information about any of these classes. If you are interested in hosting a workshop at your location, we'd be happy to speak with you. October 31 - November 5, 2016 -- Graham, North Carolina at the Handy Village Institute. Wind Turbine Design and Construction, HANDS-ON. Class did not meet minimum enrollment by the deadline, but will be rescheduled for Spring 2017. November 7 - 12, 2016 -- Graham, North Carolina at the Handy Village Institute. Wind Turbine Tower Erection. Class did not meet minimum enrollment, will be rescheduled for Spring 2017. March 28-April 2, 2016 -- Graham, North Carolina at the Handy Village Institute. Class completed with awesome results! Any time of year -- Fort Collins, Colorado. HANDS-ON. We are now offering personalized, one-on-one workshops for students or small groups. Each student will take the wind turbine they built home with them! Contact us for more details and pricing. Advanced Off-Grid System Technology for Renewable Energy Professionals, Aurora, Colorado at the Ecotech Institute. Registration is now open! 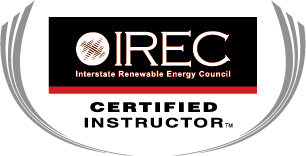 April 19 - 21, 2016 -- Advanced Off-Grid System Technology for Renewable Energy Professionals, Aurora, Colorado at the Ecotech Institute. Class completed, excellent results! Any time of year -- Fort Collins, Colorado. We are now offering personalized, one-on-one workshops for students or small groups. Contact us for more details and pricing. November 28 and 29, 2016 -- At the Ecotech Institute, Aurora, Colorado. Registration is now open! Please Contact Us if your local fire department or AHJ would like to book this seminar, or if you are a professional renewable energy installer who has been requested to train your local fire department. For all-volunteer fire departments, are fees are waived other than travel expenses. December 1, 2016 -- At the Ecotech Institute, Aurora, Colorado. Registration is now open!